I thought this month is supposed to be rainy! Yet the rain only comes very rarely, and when it does come, it only lasts like what, 5 mins? Pffft. But thank God these few days have been cloudy, that really helps decreasing the high degrees. Anyway it was still really hot yesterday, and I need to find some kind of solace. Then I dragged the brother to the nearest minimart and bought few ice cream. I was really satisfied by the frozen snack that I also dragged the boy to get some more ice cream at night. I never eaten ice cream that much in one day before. So here are what I consumed yesterday. These are some of my favourites I must say. Do buy some if you need something cold to beat the heat. 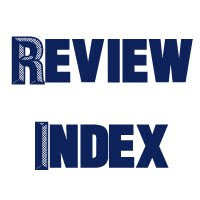 And no, this post is not advertorial at all. 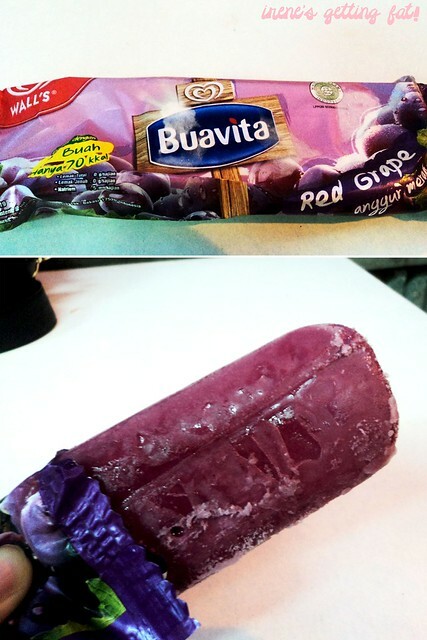 This is my fav fruit ice. 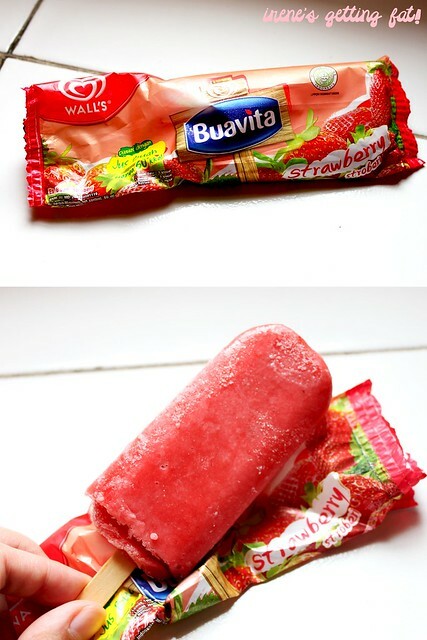 Actually, Wall's Buavita comes in three flavours, which are strawberry, red grape, and kiwi. But this is the best one for me. The strawberry taste seems rather real, and it even has small chunks of strawberry fruit hidden in the ice. It's fresh and sweet, definitely moreish. This is the brother of the strawberry one, but the taste is less real for me. The grape flavour somehow resembles a grape bubblegum taste. It's still refreshing though, especially in Jakarta's endlessly high temperature. This one, I've to say, is my least fav compared to its two brothers. I just don't buy the kiwi taste. It's kinda weird for me. But I notice that none of these three fruit ice is overly sweet. Too bad there's no Magnum temptation fruit here in Indo. That's my fav Magnum in Sydney. 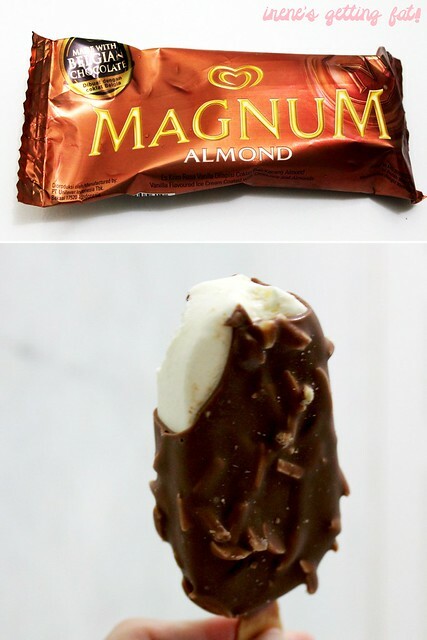 Instead, there's Magnum almond that almost as tempting as Magnum temptation fruit. This ice cream is a real deliciousness, the chocolate coating is delicious, and the almond chunks make it even better. 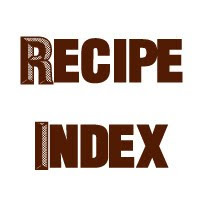 The vanilla ice cream is smooth and I believe that nothing can go wrong with vanilla ice cream and chocolate coating pairing. 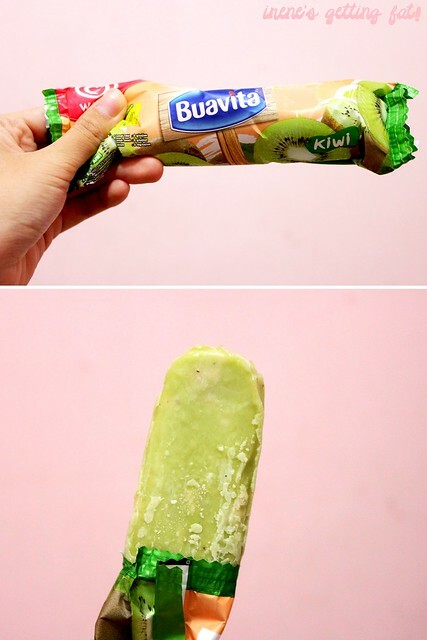 Binggrae is a Korean ice cream company (correct me if I'm wrong), that offers unique Korean ice cream. Their ice creams are quite pricey, but some of them taste really good. One of my fav is this vanilla and read bean ice cream. 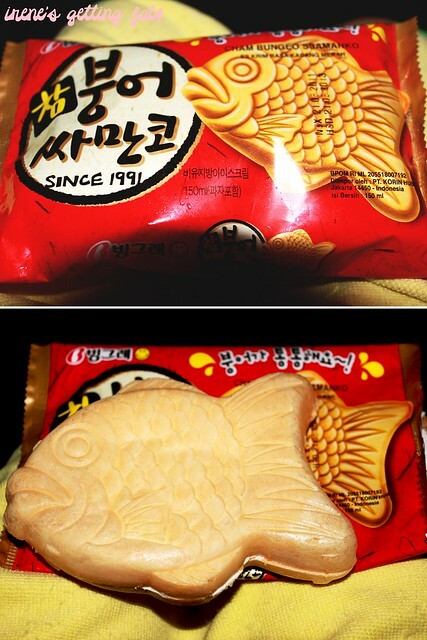 The ice cream is enveloped by a thin layer of soggy wafer, shaped like a fish. Cute no? The vanilla ice cream is much more than the red bean, but as the red bean part is sweeter than the vanilla, they balance very well. 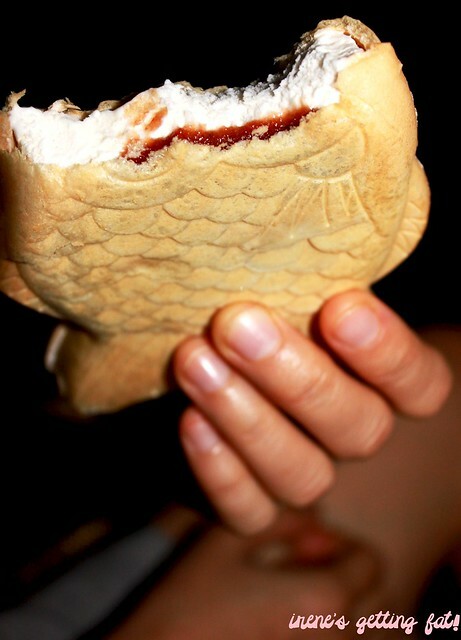 I love the marriage of smooth texture from the vanilla ice cream and the grainy texture from the red bean. I love the taste too, and the soggy wafer adds nice extra texture. Recommended. I was really full of ice cream already, but then the mom came home and bring this Campina's ice cream. It's the family's fav, as each one of us have our own fav flavour. Mine is the choc chips, although I don't mind combining them together. The ice cream is smooth, except for the choc chips which has chocolate flakes. The cappuccino flavour is a bit strong, so I tend to get just a bit of it. 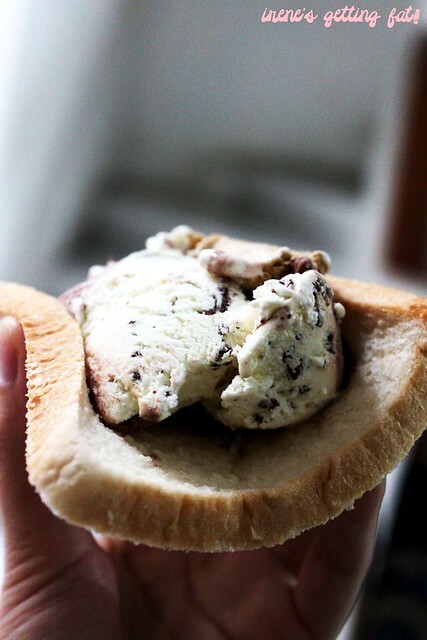 I don't know who invented the way to savor ice cream with bread, but he sure is a genius. I love eating ice cream with white bread. 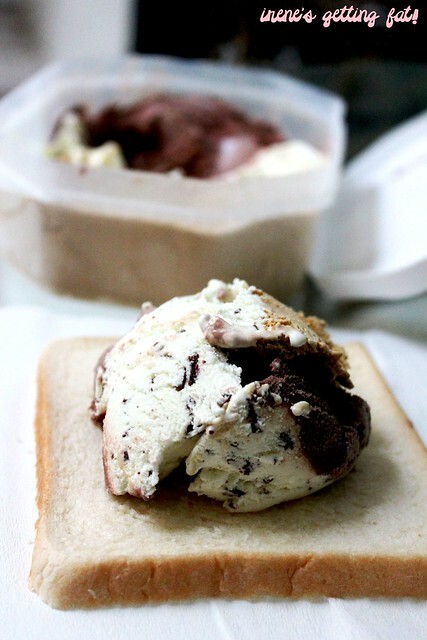 Put huge scoop(s) on a slice (or maybe two), and enjoy when the bread soaks up the melting ice cream. Bliss. The only bad thing from the ice cream day is the kilos I gained the next day. Oh what can I say, the ice cream was tasty hehee. So, have you ever eaten this much ice cream in one day before? Being slightly lactose/dairy intollerant me and ice cream don't get along all that well. It doesn't stop me though! 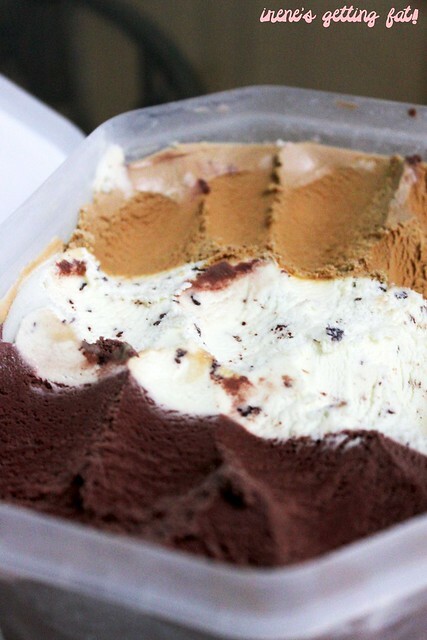 The three flavour ice cream tub there with the chocolate and coffee flavours is to die for. I wish we had that here instead of the typical chocolate,vanilla and strawberry. There's always one that everyone doesn't like! I don't think I've had that much in one day lol but I'm willing to give it a go this summer! Yummy!! i love magnum almond and binggrae melona :) i wanna try Samanco!